Background: Since the advent of the Roux-en-Y Gastric Bypass (RYGBP), an increasing number of patients with altered upper gastrointestinal tract anatomy require endoscope retrograde cholangiopancreatography (ERCP). 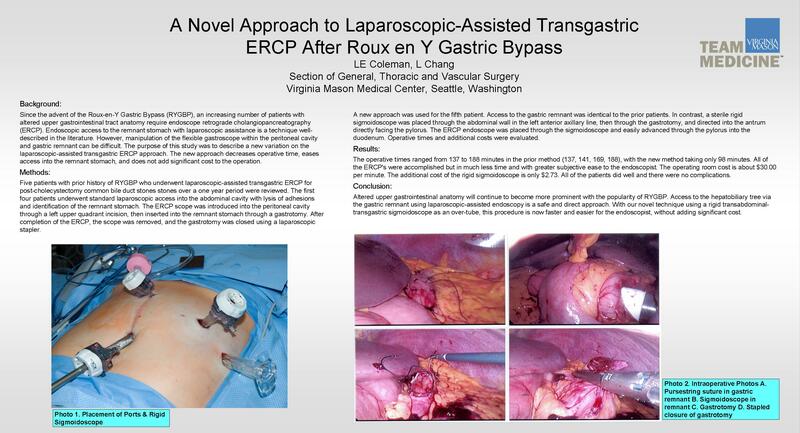 Endoscopic access to the remnant stomach with laparoscopic assistance is a technique well-described in the literature. However, manipulation of the flexible gastroscope within the peritoneal cavity and gastric remnant can be difficult. The purpose of this study was to describe a new variation on the laparoscopic-assisted transgastric ERCP approach. The new approach decreases operative time, eases access into the remnant stomach, and does not add significant cost to the operation. Methods: Five patients with prior history of RYGBP who underwent laparoscopic-assisted transgastric ERCP for post-cholecystectomy common bile duct stones stones over a one year period were reviewed. The first four patients underwent standard laparoscopic access into the abdominal cavity with lysis of adhesions and identification of the remnant stomach. The ERCP scope was introduced into the peritoneal cavity through a left upper quadrant incision, then inserted into the remnant stomach through a gastrotomy. After completion of the ERCP, the scope was removed, and the gastrotomy was closed using a laparoscopic stapler. A new approach was used for the fifth patient. Access to the gastric remnant was identical to the prior patients. In contrast, a sterile rigid sigmoidoscope was placed through the abdominal wall in the left anterior axillary line, then through the gastrotomy, and directed into the antrum directly facing the pylorus. The ERCP endoscope was placed through the sigmoidoscope and easily advanced through the pylorus into the duodenum. Operative times and additional costs were evaluated. Results: The operative times ranged from 137 to 188 minutes in the prior method (137, 141, 169, 188), with the new method taking only 98 minutes. All of the ERCP’s were accomplished but in much less time and with greater subjective ease to the endoscopist. The operating room cost is about $30.00 per minute. The additional cost of the rigid sigmoidoscope is only $2.73. All of the patients did well and there were no complications. Conclusion: Altered upper gastrointestinal anatomy will continue to become more prominent with the popularity of RYGBP. Access to the hepatobiliary tree via the gastric remnant using laparoscopic-assisted endoscopy is a safe and direct approach. With our novel technique using a rigid transabdominal-transgastric sigmoidoscope as an over-tube, this procedure is now faster and easier for the endoscopist, without adding significant cost.